ARCANE RADIO TRIVIA: The Mike Jr.
104 South Wabash Avenue in Chicago is now a CVS. It's under the loop, giving the block a subterranean feel. Utility Stores, if it was a real company, a holding company, a distributor, retailer or manufacturer is long gone. All that's left today are yellowed ads in western pulp magazines and back issues of Popular Science. They sold toy scooters, caps, cap pistols, and the wartime innovation: toy gas masks. They sold the Lektrolight, a flameless lighter, the Gyro-plane a wind up toy airplane, an intercom system built into telephones, A Jet Propelled toy Speedboat, a desktop adding machine, the instant drying Speedry Brushpen, and not only the Mike Jr. but also the Real Mike. 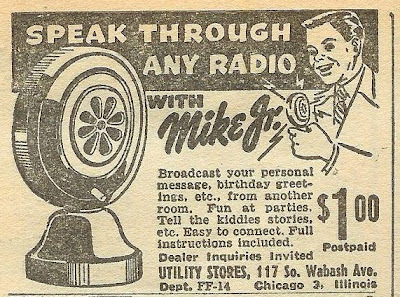 The Mike Jr. was being sold in abotu 1950, the "Real Mike was being advertised in 1947. What makes this device interesting is that thirty years later, Ron Popeil debuted an FM version that sold a million units. I wrote about that here. This AM version, marketed directly though ads in the back pages of gadget-magazines is it's grandfather.